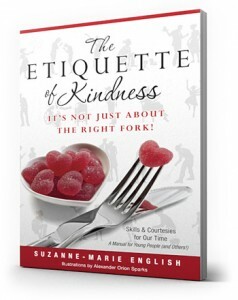 Etiquette of Kindness | It's Not Just About the Right Fork! This is a book for young people and the adults – teachers, friends, parents, family members – who love them; who want to help them to be more skillful and to feel more comfortable in their daily lives. The Etiquette of Kindness is especially dedicated to kids around the ages of 9-16 who face many questions and deeply personal concerns and fears about fitting in as they move from childhood out into the world as young adults. The Etiquette of Kindness springs from the author’s passion for teaching young people of varying personalities and backgrounds door-opening, confidence-making skills to help them in their lives today and in their futures tomorrow! For more than fourteen years, Suzanne-Marie English has taught these opportunity-making skills in classrooms with 6th, 7th and 8th graders where all the information is shared from the standpoint of “we” and of kindness in action! It has been her delight to see the students happily gain greater self-confidence as they learned skills and caught fire with kindness! True? Necessary? Kind? — Important Challenge Anytime! We Love Our Fan Mail! The Elegance, Fun and Expansiveness of Math — Oh, Yes! We want to encourage — and prepare — all of our kids to Dream Big Dreams!